The major debate when it comes to sliding glass door systems is whether top hung or bottom rolling is better. 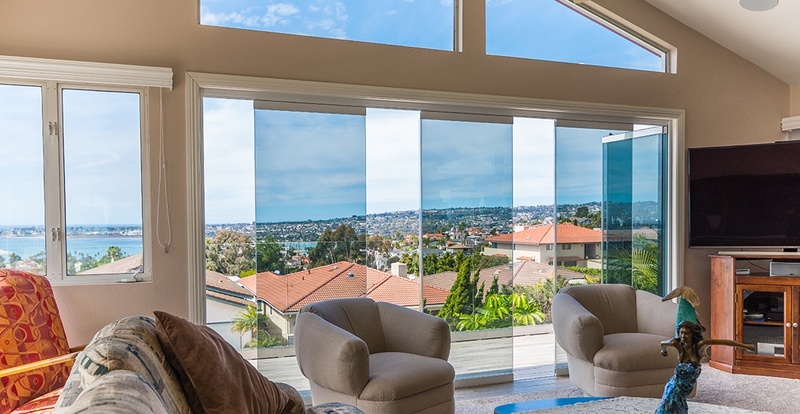 Before purchasing a sliding glass system for your home, you need to think about the pros and cons of the two options, as they have vastly different things to offer in terms of safety, function, and aesthetics. In fact, in all of this criteria, you’ll see that top-hung system come out on top. 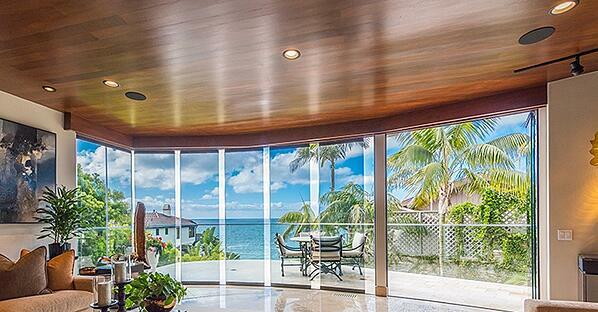 With top-hung folding glass walls, panels open and close in a smooth movement. This is because the ceiling acts as the foundation for the track rather than the floor. The top track supports the weight of the panels, whereas the bottom track takes no weight whatsoever. All this means that you can operate the sliding doors with little effort, even when they’re heavy. This is ideal for homeowners with limited mobility and it is more convenient for just about everyone. The smaller amount of friction in a top hung system extends the lifespan of the wheel assemblies. This means that top hung sliding glass doors rarely suffer from any problems and are extremely durable. Top hung systems function in a wider variety of settings than bottom rolling systems. For instance, they allow for a curvilinear movement, which means you can have curved as well as flat panels. Plus, you can use a top hung system when your flooring is uneven. Another way that top-hung systems are versatile comes from the open combinations. With a bottom rolling system, sliding doors are either partially open or closed. With a top hung system, you have these two options along with two more: completely open and air gaps. This is because you can slide glass panels over each other and stack them to the right or left, indoors or out. Finally, top hung systems provide easy access to different components. This improves usability yet further. Several factors contribute to the improved appearance you receive from top hung sliding glass systems. One, as we’ve already seen, is the possibility to use curved panels, which is impossible with a bottom rolling system. Another is the chance to conceal the mounting hardware in the ceiling, while the bottom track can be recessed and hidden for a clean threshold. A third is the option to use frameless panels. Top hung systems improve your home security. Rollers have safety locks to prevent the doors jumping off the tracks; additionally, there is no way to lift the panels off the tracks or pry them out of alignment, which protects you from intruders. When you combine this with extra-strength glass, it is impossible for someone to break in through the sliding glass doors. Plus, these benefits also protect you from extreme weather conditions, like heavy winds. Check out this great review from one of our customers that details some of the security benefits of a top hung system like Cover Glass. As the trolley is unable to slip from the track with top hung sliding glass doors, there is never any need to make repairs. In addition, the wheel assembly is in the header rather than the base, meaning that the rollers and bearings are protected from contaminants. Bottom rolling systems are only suitable for some homes. For instance, if you have uneven flooring, you may have to level the surface before installing a system. If you neglect to do this, the uneven floor can cause the system to tilt, making it incredibly difficult to move the panels. In some cases, it may be better to keep a clean threshold, which is impossible with a bottom rolling system. Plus, the visible bottom track may be unsuitable or unappealing to homeowners for practical or aesthetic reasons. Finally, as all the weight is concentrated in the two bottom wheels, bottom rolling systems always require more force to move. This may make them difficult to operate for some people. With bottom rolling systems, there is a risk of rolling elements jumping from the track. This not only impacts performance, it can be dangerous for the user. Rollers and bearings often become dirtied, clogged, or blocked with debris. This ruins functionality and requires complicated cleaning. It is possible to push or lift the bottom rolling sliding doors out of alignment. 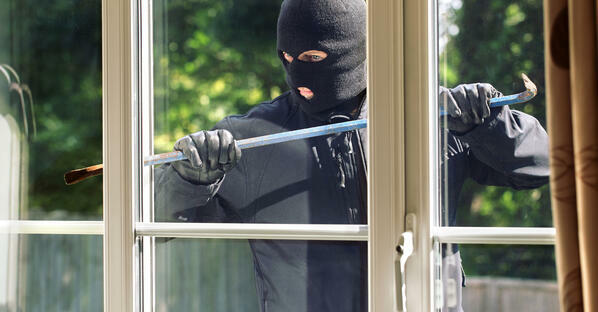 This puts you at risk for forced entry — and simply installing a high-quality locking system will do nothing to protect your home from an intruder. For the same reasons, these types of sliding doors offer no protection from strong winds. It is clear that top hung sliding glass systems are the better option, whether your priorities lie in security or you are concerned more with appearances. Whereas a top hung system optimizes home safety, a bottom rolling system is easily manipulated. Furthermore, top hung systems suffer from none of the restricted usage or poor aesthetics of bottom rolling systems. The conclusion for every homeowner should be obvious: top-hung systems are the right choice for you. Want to learn more about our frameless glass door systems?